In May 1851, staff of the Bell included Mary Ann Scotter the cook, Thomas Amis a waiter and James Fitt, boots. The latter being accused of stealing the cook's purse. 1000 pairs of American Overshoes, 20 pairs of Enamelled Napoleon Legs, French Wellington Fronts, Men's, Women's and Children's Boots and Shoes; A genuine Grocery and Provision Stock, consisting of Sugars, Teas, Cheese, Fruit, 2 casks of American Beef, prime Bacon, Oranges, 300 pints of Butter, Normandy Pippins, Muscatels (in layers), &c., &c.
Believed to date from 1480. Given as the BLUEBELL 1743 to 1822. It was announced 5th & 19th February 1743 that Sarah Benison would continue to keep the BLUE BELL following the death of husband John. The Hell Fire Club met here c1754. Thomas Parslee Respectfully begs Leave to acquaint his Friends, and Public, that he has taken on the commodious and well-situated Inn, called the BLUE BELL, on Hog-hill, where he has laid in a fresh assortment of the best Wines and Liquors, with the finest London Porter. He humbly solicits the Support of those who hitherto used the above Inn, and assures them, and all others who may be inclined to encourage his Undertaking, they may depend upon his utmost Assiduity and Attention being exerted to merit their Favours. Note : London Papers taken every day. Embraced the views of French revolutionaries. Members said to be `of the lowest description'. 23rd November 1804 : Charlotte Parslee offered a Reward of Five Guineas to any person who successfully reported the offender or offenders, responsible for stealing a Mahogany Trunk from an upper room of the BELL INN on the evening of Sunday 18th November 1804. The Trunk contained a black silk spencer (? ), a black silk cloak, trimmed with crape, a black shawl of Norwich manufacture, a square Japan muslin shawl and a black silk bonnet. All had been recovered having been found in the stables of the LAMB INN. Charlotte Parslee announced 9th March 1809 that after twenty six years, she was compelled to leave the house and had taken on the WHITE LION, White Lion Street. The information was published again on 25th March 1809 and at the same time, George Rampley announced that he had taken, that day, possession of the BELL INN. He had previously been at the GEORGE INN, St Stephens. The Eldon Club, founded 1831 met here. On the evening of Friday 16th February 1835, a respectable party of friends met to celebrate the opening of a new large room there. An excellent collation was tastefully served up by the landlord, Mr. Leggatt, which together with the wine and dessert, gave great satisfaction. 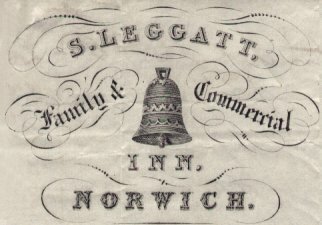 On the 15th March 1845, Samuel Leggatt thanked the Ladies and Gentlemen who had patronised the Inn for the previous 17 years and advised them that he had completed the most Extensive Alterations. Flies were in constant attendance to the Railway Station and an Ordinary was served every day at Half-past One o'clock, at Moderate Charge. 5th January 1850 - Mr. F. H. Spanton, late of the KINGS ARMS INN, Timberhill, advised his Friends and the Public in general that he had taken the BELL INN with a determination to merit their continued support. The Directors of the Eastern Counties Railway appointed Mr. Spanton to provide Omnibuses, Cabs, &c. for conveying Passengers to and from the Stations - November 1851. On the same date, the Proprietors of the NORFOLK HOTEL and the ROYAL HOTEL informed that, notwithstanding recent arrangements made by the Eastern Counties Railway Company, they would continue to convey passengers at the usual fares. They also stated that although they would no longer be able to stand in the Station Yard, they would await outside the Station Gates and convey to any part of the City, Free of Charge. A fire broke out at 10:00 pm on Tuesday 26th April 1853 in a third storey room used by servants. So fierce was the fire that the room could not be entered, but a hose, fed from a hydrant near Red Lion Street, delivered a plentiful and continuous supply of water through the window. Fires also broke out in adjoining rooms and the bedroom below. The main fire was subdued in about ten minutes and the other fires were swiftly extinguished. There was substantial damage but Mr. Spanton was insured with the Sun office. Mr. Spanton said that, owing to the respectability of the friends of Alfred Baker, errand boy at the Bell, he had no desire to prosecute the lad for having stolen ten shillings and a pistol from him and six shillings from the ostler. The boy was reprimanded and discharged at the hearing held Saturday 14th May 1853. On 3rd March 1855 William Culyer announced that he had entered the Inn and would be providing an Ordinary at 2:30pm and 3:30 pm on Market days. This seems a short lived occupation, since on 19th April 1855, Mr. John Murnane advised that the Hotel was about to undergo very important alterations to afford greater accommodation. The Glee Club met here on the evening of Wednesday 13th October 1858. Glees included "Here in cool grot," "Look on the bright side of life" and "The brave old Teneraire." The Band performed the overture to Figaro and the Excursion Gallop with great spirit and precision. In 1858 John Murnane, proprietor, advertised `The most central and cheapest family and commercial hotel in Norwich'. 6th September 1860 - Benjamin Smith thanked his many friends for the patronage hitherto received and begged to state "that no exertion shall be wanting on his part to merit that decided preference given to his house by the proper execution of those duties necessary to their domestic comforts and convenience...." and he felt "particularly anxious to assure Visitors at the Ensuing Festival that they will find their comfort sedulously attended to." Benjamin Smith informed his Friends and the Public that the Large Room would be Re-opened on Fair Day 18th April 1867. Used as headquarters and billets for the American Women's Army Corps from 1943 to 1945. Reginald Charles Thomas Smith was manager of the premises in September 1943 when accusations were made that black-out curtains in the stock room were not drawn properly and allowing light to show. The case was dismissed Saturday 11th September 1943. Reopened as a freehouse c1976. Reopened 1994 as the first J. D. Weatherspoons operation in Norwich. Part of the building now used as a Building Society. Re-working of facade in the late 18th, early /mid 19th century. Includes crenelated <sic> parapet, sash windows and quoins. Alteration of door to make pedestrian only entrance to interior courtyard (originally for coaches) now covered and used as a bar area. Bell motif on attic storey of main facade. Clock on north side of building. Considerable alterations to interior structure, particularly in late 1970's and early 1980's. An old Coaching Inn, parts of which are believed to pre-date 1485, though no evidence of this is apparent in present structure.